Sam Franklin sees big things on the horizon for Greenvelope. his eco-friendly electronic invitation service. Sam Franklin is not engaged to be married, but he spends most of his time thinking about wedding invitations. In fact, the Seattle native, a marketing and entrepreneurship major at Washington University in St. Louis, is all about the bridal business. He started Greenvelope, an upscale electronic invitation service for formal events, from his dorm room in late 2010. Franklin, 21, got the idea after reading in USA Today that couples sent 1.2 million electronic wedding invitations in 2008 via Evite.com. "At the time, Evite was the only big player in the field," he recalls. "It surprised me that people were using it to send wedding invitations." 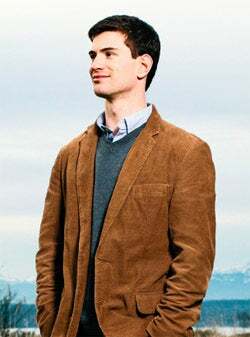 Confident in the demand for upscale electronic invites, Franklin invested $50,000 in startup funds--half saved from running a pressure-washing business and delivering pizzas during high school and half from a loan from a family member--to create templates and develop software mimicking the experience of opening a traditional printed invitation. Greenvelope launched in November 2010 with 20 templates for wedding invitations. "I saw the potential in the market, but I didn't put any numbers on paper; there was no formal business plan or sales targets," he says. "I hoped that through a good product and good customer service, the business would grow itself." Greenvelope eschews ads in an attempt to maintain an upscale feel. Instead, it charges users to send invites: Template packages start at $100 for up to 300 guests; additional invitees can be added for a nominal fee. With the help of Google and word-of-mouth, the site generated $2,000 in revenue in its first month; revenue for the first year topped $70,000. Since going live, Greenvelope has sent more than 300,000 invitations. When Franklin analyzed the sales data, he realized that engaged couples comprised just a fraction of his client base. To his surprise, businesses were customizing wedding invitation templates for corporate events. Following that discovery, business templates and corporate packages (starting at $10 per month for 50 contacts) were added to Greenvelope's offerings. Community relations manager Paige Hamp uses Greenvelope to send electronic invitations internally at healthcare IT provider Allscripts. "In a time when we are working to be more [environmentally] responsible, the invitations are a green option that still feels personal and elegant," Hamp says. Sales climbed to $10,000 per month in November 2011, allowing Franklin to hire additional staffers and expand offerings to 75 templates for weddings, corporate events and religious celebrations. As a growing number of sites introduce formal designs and envelope automation, Franklin works to keep Greenvelope ahead of the curve. "The competition is always pushing me to come up with ways to do things better," he says. Although Franklin plans to introduce new features and additional designs in the coming months, he wants Greenvelope to remain true to his core values: providing a service with a positive impact on the environment.